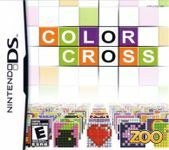 Colour Cross (Color Cross in North America) is a puzzle game for the Nintendo DS. It is a derivative of picross, but requires the user to complete grids using multiple colours with no blank spaces. The game contains 150 puzzles split between ten categories. The player's time is recorded, with time penalties incurred for mistakes. Source: Wikipedia, "Color Cross", available under the CC-BY-SA License.